My beloved maidenhair fern started as a little 4-inch specimen more than a dozen years ago. It has thrived steadily… until about 2 months ago. New fronds grow as usual, but now the fresh green leaves start showing a brown “stain” from the centre of the leaf (not the edges). Photos attached. I haven’t changed my basic watering and care routines and the fern thrived magnificently in the past. The fern is on a stand to allow plenty of air flow, in a room with a large south-facing window, but it never is in direct sun. I water and mist daily. When I water some usually seeps into the saucer, but it is quickly absorbed. A neighbour looked after my plants while I was on vacation in May, but I believe she followed my instructions and continued the same care routine. Do you have any idea what the problem is? And any advice? PS There seems to be a problem with attaching photos to the form — is there somewhere I can email them? 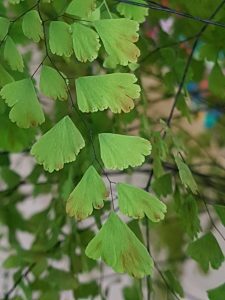 Thank you for contacting the Toronto Master Gardeners with your inquiry about your maidenhair fern. It is difficult to know what is wrong with your fern. From your description it sounds as if you are doing everything correctly to take care of your beloved fern. Leaves turning brown is a sign that you need to check the growing conditions of your plant. Inadequate watering or hard water is one of the causes of brown leaves. Ferns prefer to be watered with distilled water. Direct or improper light can also be another cause of browning leaves. The maidenhair fern prefers to be located in an east or west facing window. They do not thrive in strong light but prefer the diffused and mild sun from the morning or setting sun. Inadequate moisture is another possibility. It could be that your neighbour did not follow your directions and may have forgotten to water your fern while you were away on vacation. The soil should be kept uniformly moist but not wet. Good drainage is essential. Lastly,unfortunately the website does not allow you to attach more than one photo at a time.